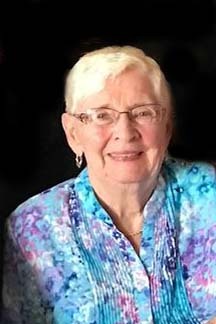 It is with great sadness we announce the peaceful passing of Verla Wilson of Cobden in the Pembroke Regional Hospital on Thursday July 12, 2018 in her 84th year. Verla Wilson nee Elliott beloved wife of the late Calvin Wilson. Dear mother of Douglas (Shelley) Wilson, Donald (Karen) Wilson, Murray (Brenda) Wilson, Marlaine Wilson, Lorna Wilson, Sheila (Joe Graham), Rhonda (Rob Mortson). Also survived by 13 grandchildren, 13 great-grandchildren, and 2 sisters-in-law Donna Faught and Beatrice Wilson. Friends may call at the Fraser-Morris and Heubner Funeral Home Cobden Sunday July 15, 2018 from 2 – 4pm and 7 – 9pm. Service in Grace United Church Cobden Monday at 11am. Interment Cobden Union Cemetery. Donations to Grace United Church Memorial Fund, or the Canadian Cancer Society would be appreciated.